As a new mother, you know how difficult it can be to go shopping with your baby. If your child is not sitting up well on her own, you are probably putting the car seat on the shopping cart or bringing in the stroller. Of course, neither of those solutions is ideal for you. That’s why the Summer Infant Cushy Cart Cover is perfect Cart Cover for moms with infants. 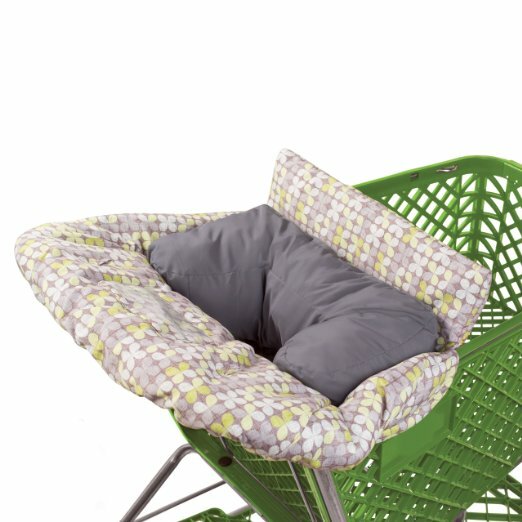 It includes a support pillow that helps your baby sit up safely in the cart at a young age. Babies love it, and so do moms. In fact, this cart cover has over 300 five-star reviews. In fact as soon as your child is able to sit unsupported the Summer Infant Cushy Cart Cover can be used. This cart cover includes a support pillow for babies who still need a little help as they are learning to sit up. The pillow is shaped like the letter U and supports their backs and keeps them from leaning to either side. Your child can sit up and look around safely. This support can be removed when your child no longer needs it. On the other hand, some parents continue to use it to give their child extra comfort. The front of the cart cover has two loops where you can attach some of your baby’s toys. This helps keep them entertained while you are shopping. As a plus, you know the toys won’t accidentally fall out of the cart and get lost in the store. This clear vinyl pocket has an opening at the top so you can slide your phone inside. It keeps your phone safe from drool, smears or drops. It is positioned in the front of the carrier where your child can watch videos or use apps while you shop. This cart cover comes in three cute designs: Clover, Dots and Diamonds, and Diamond Links. In their reviews, many mothers say that they love the styles and receive compliments on the cover when they are out shopping. The material is also soft, comfortable and machine washable. Some other cart covers only fit on regular size carts like the ones at Walmart,Target, and Krogers. The Summer Infant cover fits perfectly on standard carts, but it also fits well on over-sized carts like the ones at Sam’s Club and Costco. Some parents also use this cart cover on high chairs when they go out to eat. The support pillow and extra padding make this cart cover a little bulkier than thinner brands. In the reviews, many parents said they didn’t mind the bulkiness. In fact, they appreciated that this cart cover was so thick and made their child safe and comfortable. If you are looking for a comfortable, safe cart cover for your baby, check out the Summer Infant Cushy Cart Cover.